As Washington Gov. Jay Inslee inches closer to a likely run for president, he’s starting to sound more and more like a candidate on the stump than a two-term incumbent, even when addressing audiences at home. 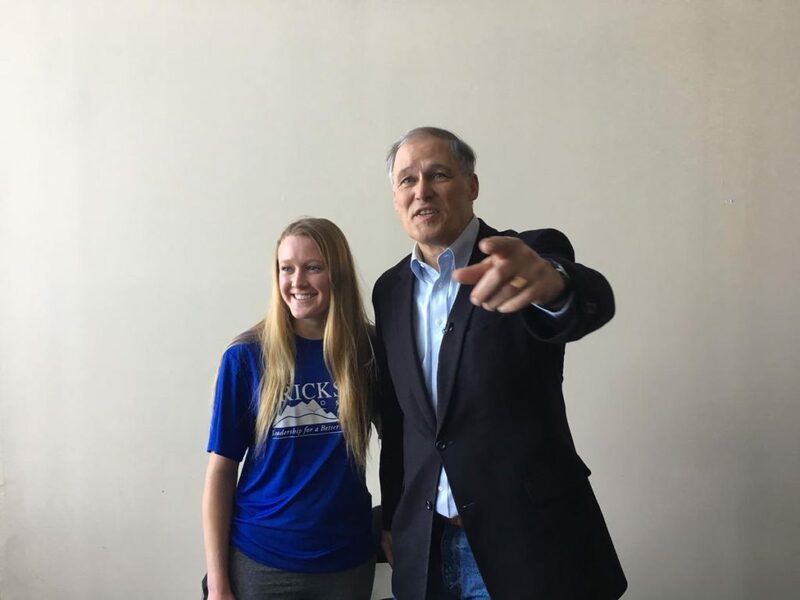 In recent speeches, TV appearances and interviews, Inslee has begun introducing himself to a broader national audience and, in the process, reintroducing himself to Washington voters who’ve twice elected him governor. Like most politicians, Inslee has an origin story. He dusted it off for the legislative forum in Olympia in January. It was the mid-1980s and he and his wife Trudi were raising “three feral sons” in Selah, Washington. The local high school was overcrowded, but voters had previously rejected several bond measures to build a new school. The school had gotten so crowded, there was talk of “double-shifting” students, according to Inslee. “I kind of looked around and said ‘Well, let’s try again,’ and nobody else would except Trudi and Bill and Sally Douglas,” Inslee said, referring to his wife and the other couple they teamed with to co-chair another bond campaign. This time it passed. But then state funding to help build the school didn’t come through. 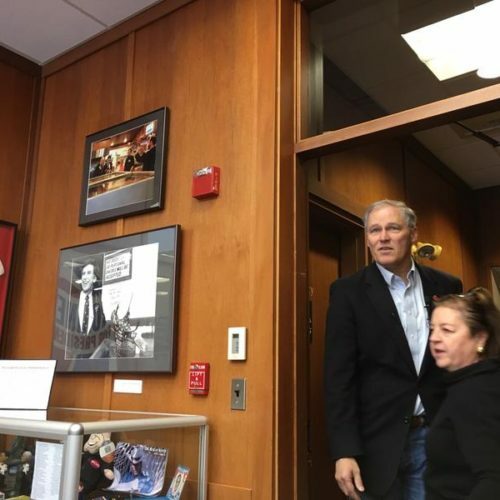 “Trudi suggested that if I really wanted to do something about this, I ought to run for the Legislature and I did,” Inslee said. While Inslee has told slightly different versions over the years, this is always how the story of his journey into politics begins. Inslee served two terms in the Washington House before he was elected to Congress from the Republican-leaning 1st Congressional District. He served one term, voted for the federal assault weapons ban and was swept out in the 1994 Republican Revolution. In 1996, Inslee ran for governor but lost in the primary. Eventually, he and Trudi moved to Bainbridge Island where he again ran for Congress, this time from the 4th Congressional District, and won. He went on to serve seven terms. It was during this time that Inslee found his signature issue: climate change. In 2007, Inslee published a book, “Apollo’s Fire: Igniting a Clean Energy Economy” and began, in Al Gore fashion, sounding the alarm on the need to address global warming. He also sponsored federal climate change legislation. In 2012, Inslee resigned his seat in Congress to run again for governor. He beat Republican Rob McKenna, the state’s attorney general. 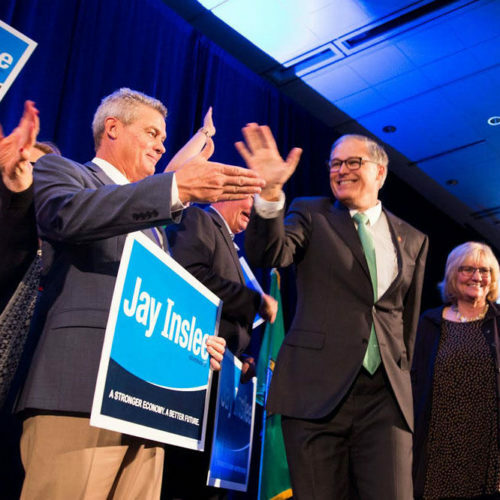 From day one, climate change was a front-and-center issue in the Inslee administration. At his inauguration, Denis Hayes, the president and CEO of the Bullitt Foundation and an Earth Day organizer, framed Inslee’s election as groundbreaking. “Jay Inslee is the first political chief executive in American history to be elected principally on a platform of combating climate change,” Hayes said in a speech in the Capitol rotunda. Six years later, Inslee is serving his second term as governor and “seriously considering” a run for president on a platform of fighting climate change — an issue he says is no longer an abstraction. “What used to be a graph on a chart is now ash on the hood of your car in Seattle when you wake up last summer and the swimming pools in Wenatchee and Tri-Cities are closed because kids can’t go outside and can’t breathe,” Inslee said at the legislative forum in January, referring to the impacts of forest fire smoke. 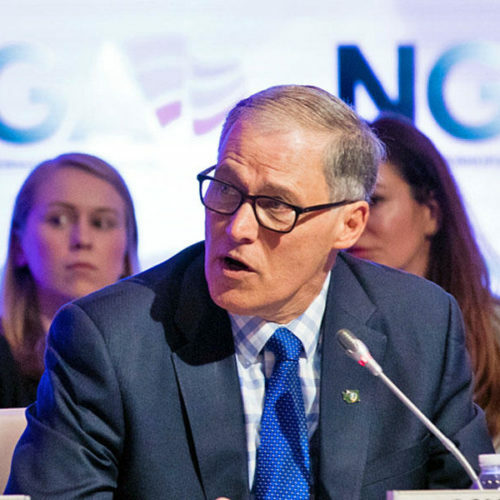 As governor, however, Inslee has been stymied in his efforts to enact a cap-and-trade system or a carbon tax. Republicans, who controlled the state Senate for several years, actively blocked the proposals and warned they would raise energy prices and put Washington at a competitive disadvantage. Inslee’s fellow Democrats in the House, meanwhile, proceeded cautiously on ambitious climate legislation. This year, Inslee has pivoted away from trying to put a price on carbon, following the defeat of a carbon fee measure put forward to voters in November. Instead, he’s proposing a suite of measures to reduce carbon pollution. They include a low-carbon fuel standards and a clean electricity initiative. “One of the things I’ve learned is that there’s no silver bullet here, there’s kind of silver buckshot,” Inslee said last month in a speech to students at Saint Anselm College in Manchester, New Hampshire. “He does bring a bit of that Washington, D.C. partisanship to Washington state,” Ericksen said. But Ericksen, who co-chaired President Donald Trump’s campaign in Washington and later worked for his transition team, is also quick to offer a positive take on Inslee. 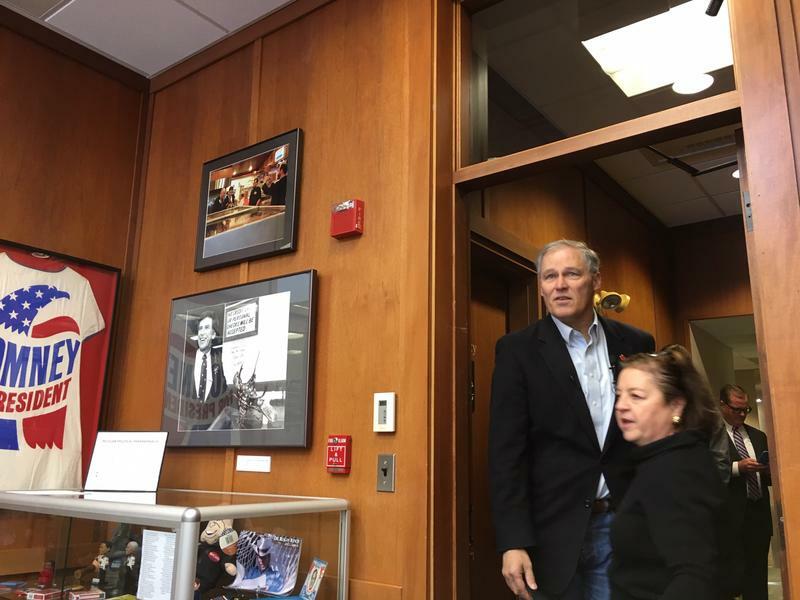 As Inslee explores a run for president, he’s also burnishing his credentials as governor. In the process, he’s talking up his home state. “I’ve got a fantastic story to tell, unsurpassed by anywhere else in the country,” Inslee said earlier this year. It’s a story, Inslee said, of a state that’s tackled education funding, raised the minimum wage, passed paid family leave and expanded access to voting. He often notes that Washington is ranked as a top state for employers and for workers. Inslee also highlights his recent proposals to address orca recovery, pardon people with marijuana convictions and create a public health insurance option. Of course, Republicans have a long list of what they consider to be Inslee’s failures and shortcomings. For instance, they point to the decertification of Western State Hospital and the resulting lost of $53 million in federal funds a year. They also criticize Inslee for his embrace of new and higher taxes, including a new capital gains tax, especially after saying he wouldn’t advocate for higher taxes during his 2012 campaign. Inslee, who clearly relishes being governor and hasn’t ruled out a run for a third term, tends to shrug off the criticisms. He says the taxes are need to fund the state’s “moral” and “constitutional” obligations. His latest budget proposal includes plans to overhaul the state’s crippled mental health system, including funding for the pre-design of a new state psychiatric hospital. Inslee played quarterback at Seattle’s Ingraham High School. He also played on the school’s championship basketball team. Today, Inslee is known for taking 100-mile bike rides. A self-professed “doodler,” he also paints and sketches as a way to unwind.